Comments: "Catnapped!" 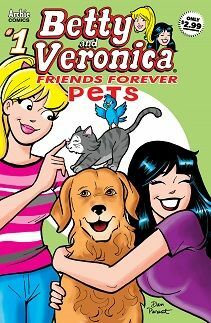 Betty's cat Caramel is lost and Veronica goes all out to find her. It is fun to watch how overboard Veronica goes. Veronica does look ridiculous in a blonde wig. The characters are all fun and enjoyable to read about. Caramel is a cute cat. "Shelter Skelter!" Betty gets Veronica to volunteer at a animal shelter. It does show that Veronica does have a caring heart. Veronica actually helps out the pets without even trying. She does a good deed and you will love her for it. All the pets are so cute. Veronica and Betty are so positive in this story it is inspiring. "Walkin' The Dogs!" Betty is shown getting a nice workout walking the dogs. The dogs certainly have fun. Nice cute art goes along with this story. "Reptile Rendezvous!" Veronica and Betty meet George a guy with some interesting pets. Not all pets are dogs or cats. Betty loves them and Veronica well she loves their food more.